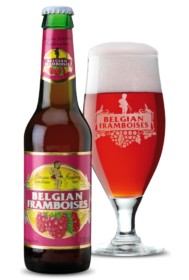 Belgian Framboises is an elegant pale pink with a white head, Belgian Framboises provides yet more evidence that a white beer forms an excellent basis for giving fruit beers a fine fresh flavour., it has an alcohol content of 3.5%. An elegant pale pink with a white head, Belgian Framboises provides yet more evidence that a white beer forms an excellent basis for giving fruit beers a fine fresh flavour. The nose is particularly original. Raspberry aromas are subtly blended with blackcurrant to very attractive effect. Beautiful fruit and perfectly balanced, neither too sweet nor too beer-like. The raspberry and blackcurrant come through clearly, with the blackcurrant becoming more dominant at the finish. An unusual, thirst-quenching beer.